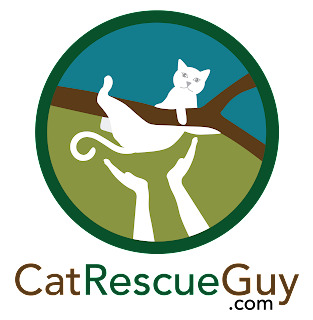 Kitty is a tame, male orange tabby that ran across the highway from his house into a wild, wooded area and climbed a tree. His owners had tried unsuccessfully to get him down for two days before they called me. I arrived to find him about 20 feet up an oak tree which was surrounded by privet, briars, and small pine trees. I had to clear an area to give me room to work and then climbed the tree. Kitty was a mostly cooperative sweet boy. He did hiss at me a couple of times just to let me know that he could take care of himself if needed, but mostly he just cried and cried. He was friendly and readily took the food I offered him. He refused to go all the way into a carrier however, so I had to scruff him into my cat bag. He took it very well, and was very relieved to have some food once we got down. 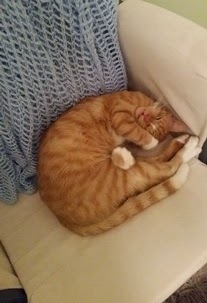 His owners sent me this picture of him as he was sleeping that night. I love to see him so contented and comfortable after his miserable ordeal. Finally now he can get some serious sleep.